Soak whole Pearl millet (Bajra) for 24 hours. Wash twice and drain water on the next day. Keep it aside and let it sprout for next 24 hours. On the third day, it would have sprouted well. Wash the Pearl millet once again thoroughly and transfer that to a pressure cooker. Pour 2.5 cups of water, cover the lid and let it cook. After the first whistle, reduce the flame of the stove and let it remain for 10 more minutes. Switch-off the flame after 10 minutes. Once the pressure is gone, open the cooker lid and check whether the Pearl millet is boiled well. If it is done, transfer that to a plate and let it cool completely. Finely chop all other ingredients like Cilantro leaves, Mint leaves, Spring onion, Big onion and Tomato and keep them ready. Transfer all these items to another wide vessel and add Pearl millet as well. Now crush Pepper corns and put it in the vessel. Finally add Rock salt as per taste and mix all the ingredients thoroughly. Cover it and let it sit for 5 minutes so that all the flavours get mixed well and then eat. Tabbouleh is a dish prepared in Middle East countries mainly using Broken Wheat & Parsley. 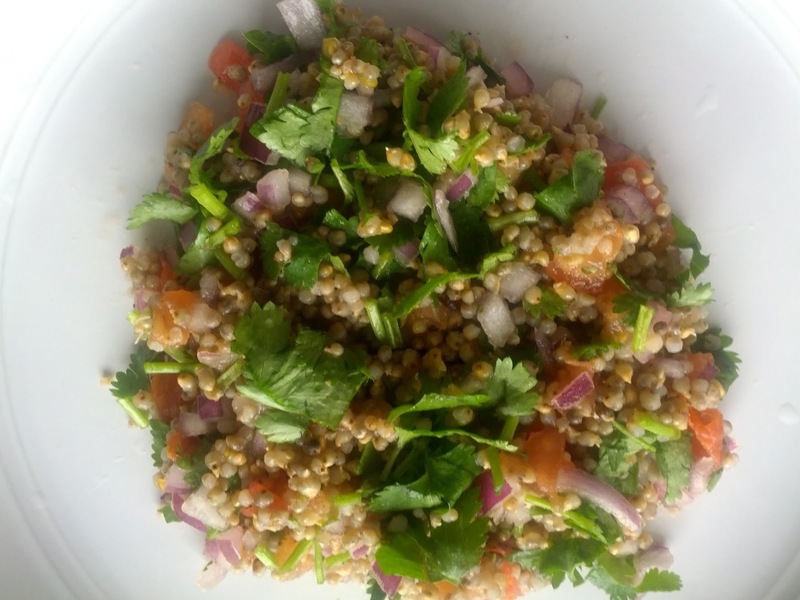 We have tried to replace it with Sprouted Pearl millet and Cilantro leaves in this recipe which turned out well. So we are happy to share it with everyone. We can also use Sprouted Sorghum millet instead of Pearl millet and make Tabbouleh.